Your favourite South Park characters are back in the second South Park themed instalment from Net Entertainment developers and it doesn’t disappoint in either graphics or game play. In fact, they’re excellent. Whether you are a fan of the troublesome cartoon kids from South Park or not you will surely find something to adore about this newest slot game from Net Entertainment. With mini games featuring the cartoons most loved characters; Cartman, Stan, Kenny and Kyle boosting your winnings with good sized multipliers, you’ll have a blast helping protect the city from the evil Professor Chaos, and hopefully win a few quid in the meantime. With 5 reels and 20 paylines on offer from as little as 20p to as much as £100 a spin and a plethora of special features you will certainly not get bored playing South Park Reel Chaos. Couple this with an unusually detailed and enthralling storyline, fantastic graphics and even better voice-overs and you are in for a treat. There are four special features in total; Cartman’s Stacked Wilds feature, Kenny’s Multiplier feature, Stan’s Multiplying Re-Spin feature and Kyle’s Overlay Wilds feature, each providing big multipliers and winnings when accessed. Cartman’s Stacked Wilds feature boosts the number of Wilds on the reel, increasing your chances at re-spins and multipliers. Kenny’s Multiplier feature will multiply your line winnings by 3, 4 or 5 and features a pleasing battle with Professor Chaos to keep the town safe. Stan’s Multiplying Re-spin feature is the most lucrative of the features, allowing you to Re-Spin until you get a winning combo, with the multiplier increasing (up to a maximum of 10) each time you spin a no-win. Kyle’s Overlay Wilds feature gives you up to 5 Wilds to play with, massively increasing your winnings, how does more than 100 times your stake sound? But these special features are by no means the highlight of the game, that crown goes to the aptly titled Mintberry Crunch Epic Bonus Spins Feature which comes into play once you have 3 bonus symbols on reels 1, 3 and 5. This isn’t the most lucrative of features; that title goes to Stan’s Multiplying Re-spins, but it does have the best part to play in the storyline with the half man, half berry Mintberry Crunch battling all of South Park foes until either all 4 foes or Mintberry Crunch are defeated. Defeating each enemy adds another unit to the multiplier and defeating all 4 minions results in a cash prize. 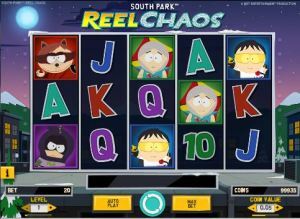 Like most newly released slots, South Park Reel Chaos was quickly available as a mobile slot as well. It works just as well on Android as on iOS. While you can play it in portrait mode, the landscape mode lets you fully appreciate the graphics, both on smartphones and tablets. You can find the troublesome kids at most major casinos that run a Net Ent platform. Some examples include Guts, Leo Vegas, Mr Green and Vera&John. 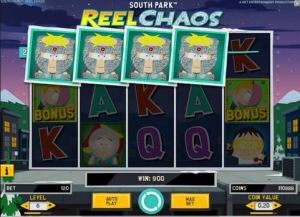 An excellent storyline with even better graphics and sound effects, South Park Reel Chaos by Net Entertainment will certainly entertain you, and hopefully induce a lovely air of nostalgia while you win up to several hundred times your own stake.